Hi friend! I hope you’ve had a fabulous long weekend and got to enjoy some sunshine and nature with the people you love. 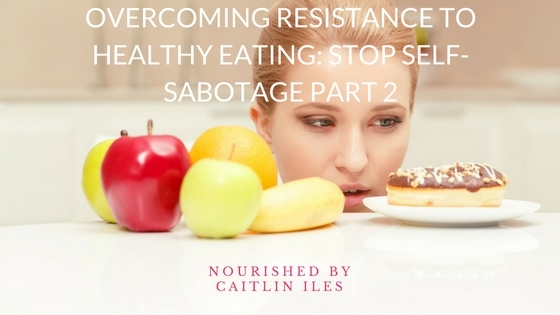 Today I’m going to sharePart 2 of my Overcoming Resistance to Healthy Eating series by looking at some common thoughts and justifications that might crop up while you’re in the process of making dietary and lifestyle changes. Remember that all journeys to reclaim health come in different packages. I’ve had many instances of taking several steps forward then falling off a cliff and landing 10 steps back. What’s important is not to look at these instances as failures, but as learning opportunities. Take note of what changes you were making and why they didn’t work and you’ll be armed with information on what NOT to do next time. Doing the same thing over and over again when it doesn’t make sense for your body just leaves you feeling frustrated and like a failure. Life, including what you eat and how you exercise, should be fun and joyful! So the most important part of all of this is not giving up when things get hard or when progress stalls or if you stumble backwards a little bit. Just brush yourself off, put your hard hat on, and get to work! You may want to read Part 1 to get up to speed before continuing. Well I did yoga today so I deserve to have a treat. I had a super stressful day and I just don’t have time to make dinner. I’ll just eat what the kids are having. Well I already ruined my breakfast, I might as well just eat junk all day. I ate well today, so I have some wiggle room in my diet. I need to cheer myself up. If my friends are drinking I have to too in order to have fun. A snack would make this movie even better. I don’t want to be wasteful. I have to clean my plate. I’ve had a hard day and need some coddling. Everyone else is eating it and I don’t want to be excluded. It’s a special occasion so I have to celebrate! I don’t want to offend my hosts/friends/family by not eating their food. Oftentimes your unconscious mind will take steps to keep you exactly as you are because, despite not being totally happy, your unconscious mind knows that you’re safe so it will do whatever it can to keep you from changing. It doesn’t know what could happen if you lose the weight, take the trip, or quit your unfulfilling job, and so it does whatever it can to sabotage your efforts despite what your conscious mind wants to do. So grab your journal and sit down to get to the root of what’s holding you back. When you feel these thoughts start to creep in jot them down ASAP and after a week or so you will have a list of triggers and justifications your brain relies on most often. It’s so important to figure out what justifications or thoughts are holding you back from achieving the body and life you desire. Once you figure them out you can work on discovering when they tend to crop up, and then how to create a plan of action to distract yourself from them. Some ways that have worked for me include distracting myself with things that I enjoy such as reading a book, going on a walk, doing some yoga poses, making a cup of tea, etc. Another modality that has helped me with cravings and self-sabotage is EFT (emotional freedom technique) you can find some great practitioners out there. 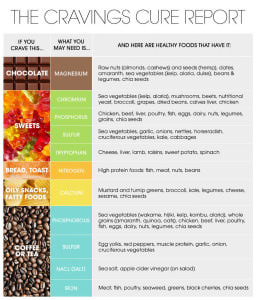 With all that being said, don’t forget that unless you have a food allergy or intolerance that keeps you from eating certain things or it’s total processed junk, you can find ways to indulge mindfully in the foods that bring you pleasure. It’s not uncommon to draw emotional connections to specific foods or meals due to the central role that food plays in cultural celebrations. As such, you can often associate certain items with specific feelings such as cookies as representative of your mother’s love or apple pie as a symbol of family togetherness and celebration. When you start changing your diet you can resist eliminating these specific foods because of their emotional connections to your past. You may feel like if you stop eating them that you are no longer receiving love or that you’re isolated from our family events. However, it is important to recognize that while food may symbolize these things to you, they are not actually love manifested. This is good news because it means that you can do certain exercises to remove the love from the food and bring it back to the person and relationship where it belongs. I suggest looking up Brittany Watkins who has lots of free resources to help you take certain emotions out of your meals so that you can indulge in them mindfully, not because you’re afraid you’ll be losing something or missing out. Sometimes your resistance to healthy eating goes beyond just the emotional or psychological desire for safety and stems from a physical issue or imbalance that causes us to have cravings that can take Herculean effort to resist. A couple of big imbalances that can cause intense cravings for sugar and carbs are candida or parasite overgrowth or a bacterial imbalance in the digestive tract. In a healthy body you would have a proper ratio of good to bad bacteria and yeast. However, years of processed foods, antibiotics, smoking, drinking, traveling, or the birth control bill can cause an imbalance in your body. These little buggers thrive on sugar and refined carbohydrates and when they get a hold of your physiology they can drive you to binge on foods you know don’t promote optimal health or wellness. The first step is to recognize that this is not a moral failing on your behalf, but a physiological issue. The second step is to find a practitioner who can support you as you bring your body back into balance using herbs, diet, and lifestyle measures. Well friend, that’s all for today! Stay tuned for Part 3 when you’ll get a look at some of the external factors that affect your resistance to healthy eating. Thanks for stopping by and have a wonderfully whimsical week! If this topic is resonating with you then make sure you download my FREE Stop Self-Sabotage Workbook by clicking here.